It is the most popular and most basic of all the casting processes along with being economical. First a cavity in the sand is formed by using a pattern made of wood, or metal. The cavity is contained in a flask. Cores are put in the cavity to form holes of the desired shapes. An extra void called Riser is created in the mold to contain excessive molten material. The purpose of this is to prevent voids in the main casting. 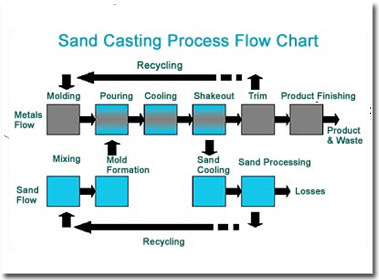 Generally sand casting consists of a two-part Sand Casting Mold. While the upper part is called the Cope, the lower part is called the Drag. A parting line or surface separates the two. Some portion of the drag is filled with sand. The cores, core print, and the gating system are placed near the parting line. The cope and the drag is assembled then sand is poured on the cope half, that covers the pattern, core and the gating system. The sand gets compacted by vibration and other mechanical processes. After this, the cope is removed from the drag. The pattern is removed. Care is taken so that pattern is removed without breaking the mold cavity. This can be taken care of by designing a draft, which is usually a minimum of 1° or 1.5 mm (0.060 in), more rough the surface of the pattern, the more the draft to be provided. In Sand Casting process the molten metal is poured in the pouring cup as a part of the gating system that takes the molten material to the mold cavity. Sprue is the vertical part of the gating system connected to the pouring cup. While the horizontal portion is called the Runners. Additionally there can be extensions to the gating system called vents which facilitates the release of built up gases and the displaced air to the atmosphere. The cavity is usually over sized to allow for the metal contraction as it cools to the room temperature. To account for shrinking, the pattern must be also made over sized The shrinkage allowances can only be approximated, because the exact allowance is determined only by the shape and size of the casting . However, various parts of the casting might require different shrinkage allowance. Air movement components (fan blades, hubs, shafts, tubes, rectangles).